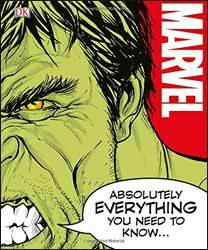 Marvel: Absolutely Everything You Need To Know is a large format hardback book with a textured cover showing a close-up up the left side of the Hulk’s face, with a speech balloon having him saying the title. The other side of his face is on the rear. Both eyes display gold foil. It contains 235 active full-colour pages depicting all of the most well-known heroes and villains, as well as many of the obscure characters and situations in double-page splashes of art and information. It is published by DK (Dorling Kindersley Limited) of the Strand, London, and retails at £17.99. The book is divided into the chapters, Characters, Teams, Locations, Science and Magic, and Key Events. The most eye-catching of these is the first; each popular hero and villain gets his/her own double page of artwork from different eras amongst a number of inset fascinating facts. They’re all here: Spider-Man, Captain America, Prince Namor – the Sub-Mariner, Iron Man, Ant Man and Wasp, Thor, Hulk, Daredevil, and many more including Captain Marvel and Doctor Strange. A multitude of bad guys line up for attention, too: Thanos, Loki, the Red Skull, Norman Osborn, Doctor Octopus, Kingpin, and my personal favourite Venom – to mention just a few. Then there are the Teams, like the Avengers, X-Men, Fantastic Four, S.H.I.E.L.D. and Guardians of the Galaxy. Several Classic Clashes, Alternative Worlds, Iconic Artefacts and Locations will have even the most die-hard Marvel fans scrabbling for previously unknown titbits of information about their favourite characters. The good thing about this book is that it will appeal to followers and casual readers of all ages who are curious about Stan Lee’s ‘babies’ and the plot lines and turning points in their existence. People will love the contrasting styles of artwork from across the years, but also accumulate brief fascinating facts without becoming bogged-down in decades of back story (much of it more than a little crazy). So, all in all a good place to start getting your Marvel general knowledge up to speed, before deciding which superhero path to go down.